Vermilion County Board Chairman Mike Marron was sworn-in Friday to serve as the new 104th District State Representative. Marron is succeeding retiring State Representative Chad Hays, who had served in office since 2010. Marron, who succeeds both Hays and legendary State Representative Bill Black, thanked both men for their leadership. 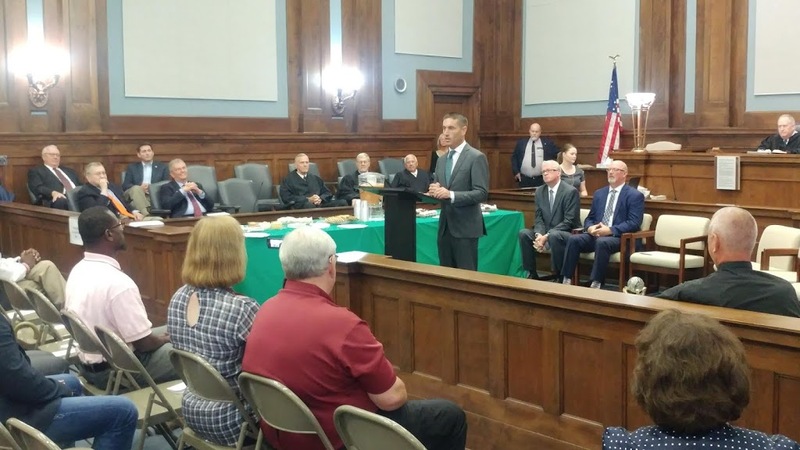 Marron was sworn in by Justice Thomas O’Shaughnessy in front of a packed room at the Rita B. Garman Vermilion County Courthouse in Danville. Marron thanked his friends and family for their support and briefly previewed some of his top priorities upon taking office. Rep. Mike Marron (R-Fithian) is a small business owner and operates a family farm with his father in rural Vermilion County. Mike most recently served as Chairman of the Vermilion County Board, where he was responsible for managing and administering the daily operations of Vermilion County’s $40 million annual budget. Mike previously represented District 2, and then served as Vice Chair of the Vermilion County Board. Marron also previously served as Supervisor of Pilot Township. Rep. Marron was a member of Governor Rauner’s transition team on agriculture issues; having previously served as Vice Chair, Secretary-Treasurer, and as a Representative of District 7 for the Illinois Soybean Association. Mike was a five-time representative of the Illinois Farm Bureau and the Illinois Soybean Association to Capitol Hill in Washington. He has also served as an ISA ambassador to Brazil and China, and has also participated in multiple trade missions, including to Haiti, Colombia, Mexico, and Ghana. In addition to his service to Illinois agriculture and to the citizens of Vermilion County, Mike Marron is an active leader in the community. Mike has previously served as Chair for the Danville Family YMCA fundraising campaign, as a member of the Danville Public Library Foundation Board of Directors, and as a member of the Bismark Lion’s Club and the Royal Sons of the American Legion. Marron and his wife Brandy reside in Fithian with their young daughter.